If I were any good with a cutting torch I’d create stuff like this for my house. 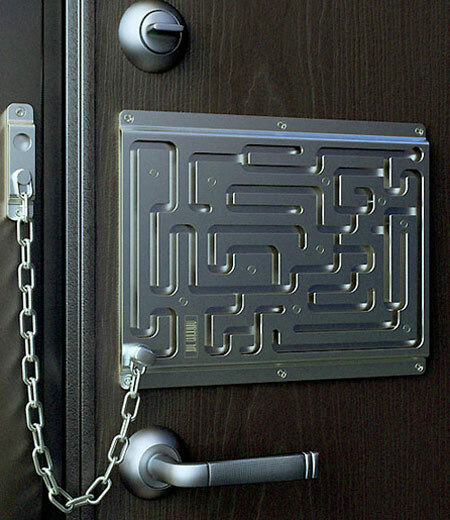 The Defendius Labyrinth security lock is an awesome take on the ole’ chain lock system that you might have on your door right now. This actual product available through Think Geek will run you around $50 should you care to partake in its laser-cut-maze-of-security fun. If I was to attempt something like this, I’d go for a lock more along the lines of the Gringots bank in Harry Potter — but since I’m broke and don’t know magic, this is a sweet-looking way to go. Of course, should you ever need to get out that door during a fire, you might be in trouble — it’s still funny though. This is not a product it was an April Fools day joke. Although Thinkgeek does has a history of making products that get enough attention. This year they are going to make the Tauntaun sleeping bag. its a shame its a joke… i know a few people who would get a real kick out of them. Anyone want to make them? I think it’d have problems getting past fire codes… Although the maze in the picture is actually really simple (just alternate left – right turns at each choice). Would be nice if you linked the original author and not the sites that rip off the content. Something like that would be really good on car doors at the bar. Too bad the chain is so long a skinny person could probably easily slide in when the door opens even if it’s locked..
@Wartex They didn’t rip anyone they gave them credit for the design. You should have checked the site first to see what was going on. Sander: I don’t know anyone, even small children, who can slip through an eight-inch opening, which is about how big that looks based on a normal-sized door handle. It’d be fairly easy to cut the chain with some bolt cutters, though, if you were really determined. Looks like something you might see in the movie Saw (insert number). Only the lug knob would be razor sharp (better to cut hurrying fingers with). The amplified voice from he_l saying “You have exactly 21 seconds to unlock the door before the room is filled with (insert obnoxious and toxic gas). Sorry about all the parenthetical phrases (but).